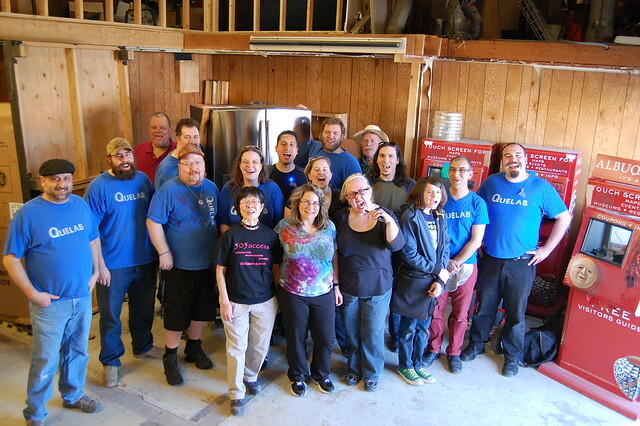 Quelab’s open house, Hack All The Things, was last weekend. The event was as resounding success with over 250 people attending! Many people hacked lots of things! Coming Soon (this Thursday, 15 November), Make: Magazine will be releasing their special “Make: Ultimate Guide to 3D Printing ” (did you see that Dilbert?). To celebrate, they’re throwing a Hangout on Google+, as well as coordinating groups of Makers to get together and talk about making things. If you’re interested in 3D-printing, if you have a 3D-Printer, or if you have no idea what I’m talking about, come on out and see what this whole thing is all about. Whether you’re a designer, inventor, hacker, tinkerer, or weekend DIYer–anyone interested in finding out more about 3D printing and design is welcome! Bring your laptops, tablets, smartphones to access the Internet and G+ Hangout On Air. The real question is how much can we do involving robotics in one month? We want to get some fun and exciting projects ready, Some options for you to build your own mini robot minion! We will also have some folks bringing in some creative projects. Not to mention what ever else our members build/find/dust off. Its still early in the month, come to our Sunday or Tuesday Hacknights 7-10pm and come learn/teach/tinker with us! If you really want you can come in robot costume, although that may be pushing it! Here is a little linkdump, of interesting robot related blog articles, (will likely grow overtime so check back!